"No freeman shall ever be debarred the use of arms" ---Thomas Jefferson: Draft Virginia Constitution, 1776. 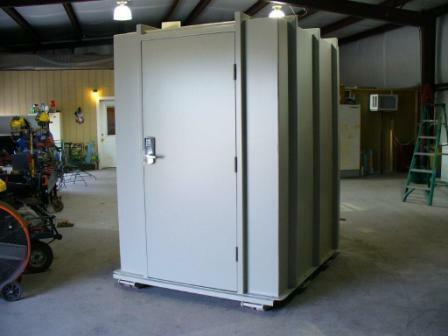 The price of our large shelters are less expensive per sq ft (floor space) than a smaller gun safes that you would find on the internet and also may double as a safe room. (internal lock release). Modular vaults may be relocated if you ever move to another house or building. Guns are expensive and should to be stored in safe place free from humidity, curious eyes and dust. One common problem is the tendency to 'outgrow' the gun safes we presently own. Many gun safes sold on the market today are too small for a growing collection which makes it difficult to organize your guns without having to remove several in order to reach the one you're after. A secure stand alone walk in gun vault would be a great option. Not only will you have an awsome place to store guns and valuables, with the vault door inside release mechanism, the room can double for a tornado or hurricane shelter during severe weather. 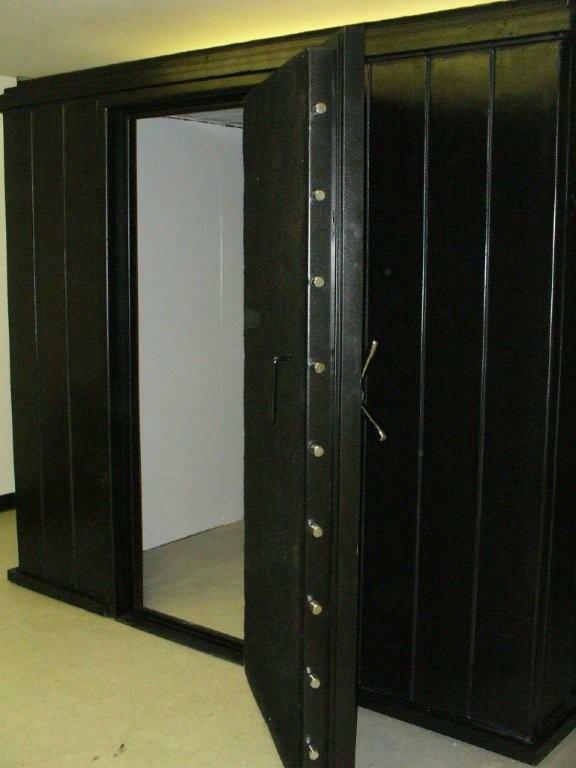 With our modular vaults, one could turn a larger walk in closet or small bedroom into a vault by using modular panels with fireproofing like found on the modular vault and safe room page. 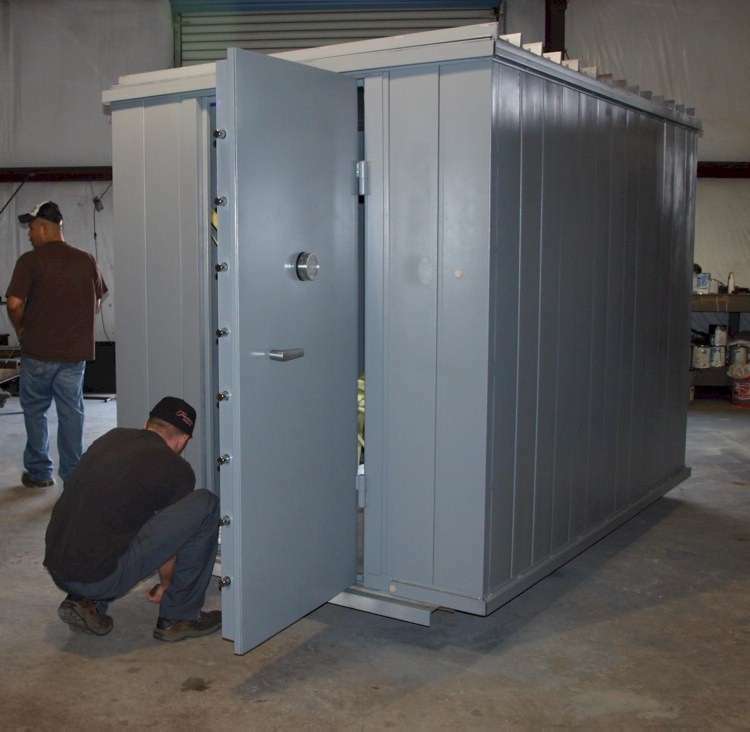 Larger vaults and modular gun vaults may be used s a safe room, in some cases, if severe weather is a problem in your area. Special venting operated from the inside of the vault is installed if used as a safe room. 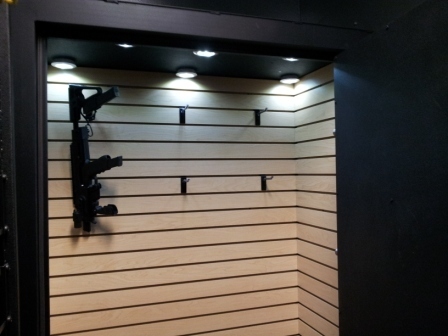 Larger vaults are generally less expensive per cubic ft than the smaller gun safes found in most stores. 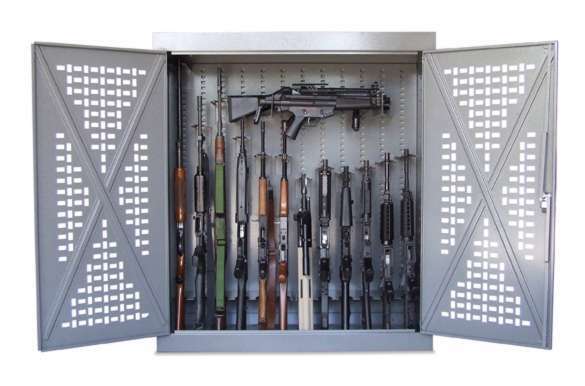 Our larger stand alone gun vaults may be designed with steel outer wall with fire proofing and gun racks.Our vaults provide excellent fire resistant properties. 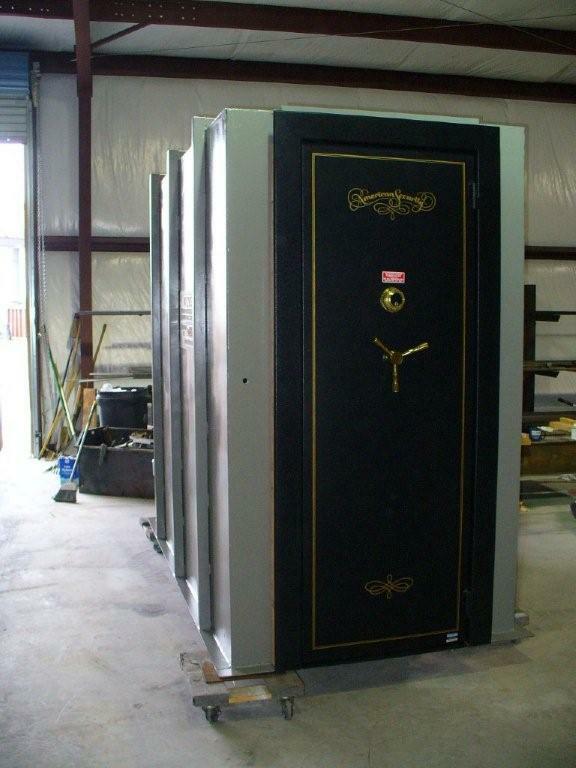 All Vault Doors are matched to the security requirements of the safe. These hefty vaults and rooms will give your investment the proper protection it needs and last for the life of your home. It's also nice to show to your trusting friends or clients your nicely displayed collection. 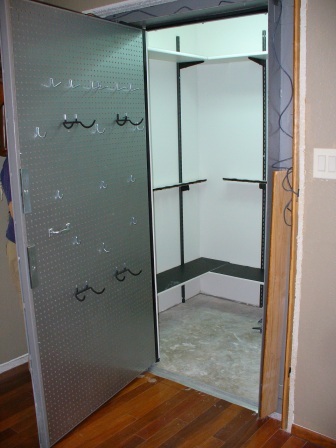 Turning a small room into a gun vault isn't as difficult as it might seem. Installing a nice vault door and making the room into a nice show piece is a great idea and something you will feel good about once it is installed. More room will allow for better organization. These modular vaults come in many sizes. 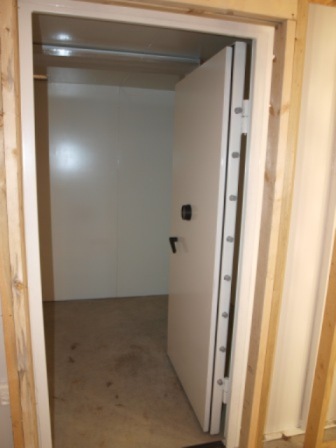 Our walk in gun vaults may be fitted with a nice vault door that will fit into your existing door opening and lead into the modular vault room. Hidden doors may also be used to prevent prying eyes. Most of these vaults are 2% or less of the total cost of a new home. Gun Vaults may be built above ground as a hidden room, gun closet and safe room or below ground beneath a home just outside under the ground hidden from view. 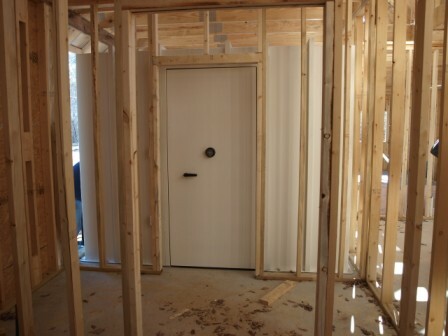 During the pre-construction a vault may be installed built under the house and later accessed from a room within the home or even from a above ground safe room. Below ground vaults may have extra exits, like an entry stairwell in the house and a secured door leading to the outside which could be exited into an adjacent building or shed. 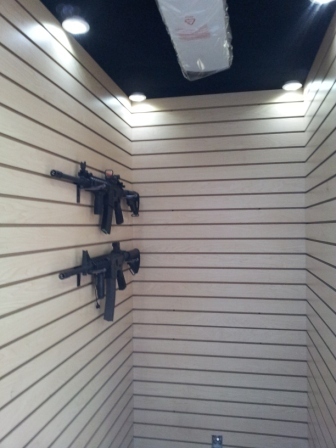 We also have modular gun vaults with excellent fire protection. 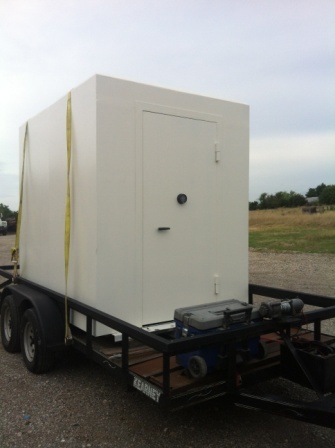 If you are building a home or need a vault room, we have many options that may fit your individual need. We have racks available to fit the needs of each customer. We also have buillt some extensive vaults using a steel and concrete design. 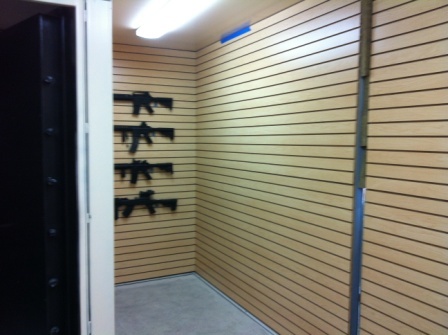 In the above pictures, a modular is gun vault has been installed and one is being prepared, prior to shipping. Weight is approx. 8,000 lbs. and will be delivered on no less than two pallets. Once at the site these room are assembled within the footprint of the vault itself, so it may go right up against walls. 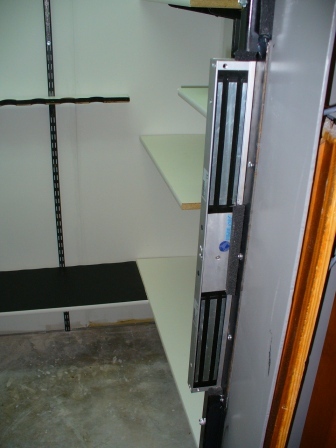 A slight dropdown of a few inches is allowed for the roof panels if going into an existing building with low ceilings. It generally only takes two people to assemble the vault. A vault like this can, most likely, be installed in a single day. Vault door is equipped with electric lock and inside release. Electrical boxes are mounted to a few of the panels. Fire sealant used between seams on the fire rated rooms. Fireproofing is generally 1-1/2" to 2" thick between outer steel skins and inside panels. Fire Rated modular vault in closet. 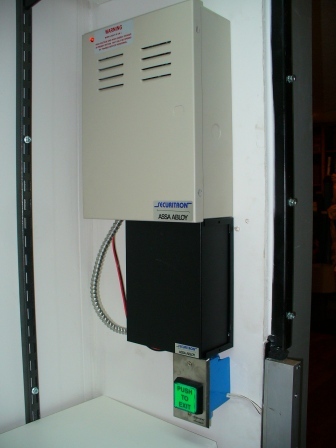 Keypad entry with 1200 lbs magnetic locks, backup power keypad and exit button. This vault has a hidden door. Lighting and gun racks included. 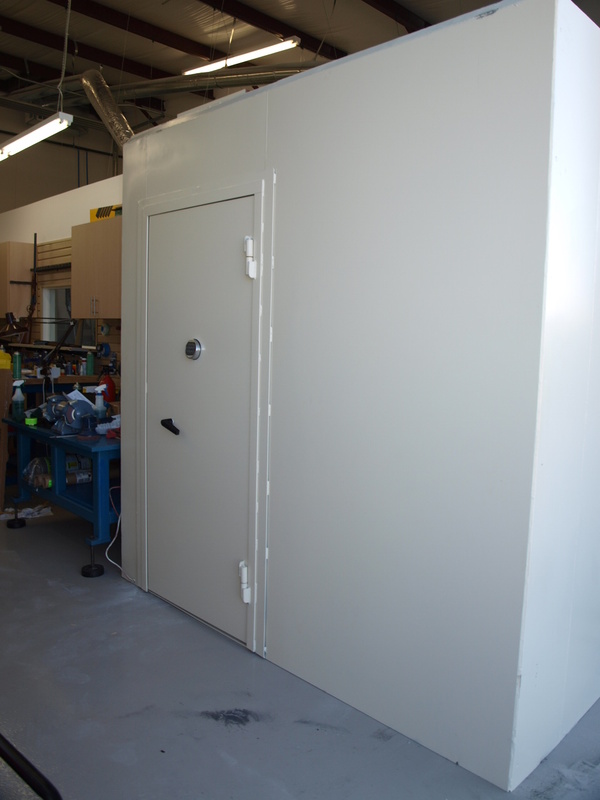 Standard or custom vault doors may be installed where needed to provide the proper security. Locks of all kinds can be integrated into the vault doors. Mechanical, keyed entry, combination, proximity, biometric are available. Electrical, Communication lines can be built into the unit. Recessed lighting and switching is installed into rooms. A below ground gun vault with several rooms inside can be a great idea for people with special applications. Below ground vaults are built out of steel and totally encased in concrete. Moisture barriers are installed in the vault room to prevent any 'sweating'. Dehumidifiers are installed if needed.